I know we are early. Big change of plans and we are now established in Las Palmas 6 weeks ahead of the start and we will probably visit the other islands by ferry and stay at the fabulous Parador Hotels. If you’ve not tired them, they are the best in Spain for the over 60’s. 35% discount and including a full breakfast as long as you book ahead and most of them are 5 stars. 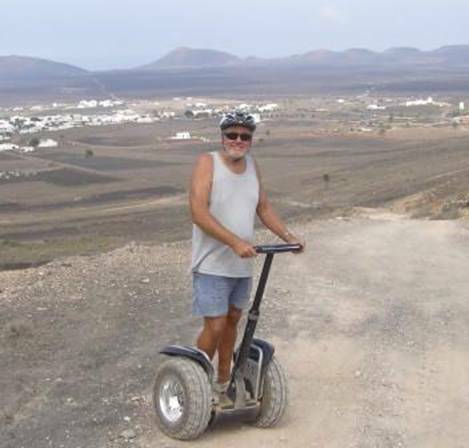 But before leaving Lanzarote I couldn’t resist it and went on an overland safari using the Segway bicycle. Unbelievable machines. The gyro keeps them upright and you just lean forwards or backwards to go! To turn is just as easy by a small swivel hand grip, one way or tother and you go! On the road they will do 20 kilometres an hour and they crawled around the hills just fine. Mind you on occasions I could have walked faster! The trip from Lanzarote to Las Palmas was pretty easy, 70nm the first day to the south coast (La Costa Calma) of Fuerteventura, anchored out and then the following day we reached (with what wind there was) across the channel about 50nm to Las Palmas. Had trouble with the Raymarine gear for two days and the problem appears to be with the electricals in the master display unit. I have kept copious notes and photos of the alarm signals and the local Raymarine techo is delighted that he has some much information to fax to head office in Spain. BUT it sounds expensive! Arriving in Las Palmas this was berthed alongside the harbour wall. I have no idea what it is although we think it has something to do with dredging. 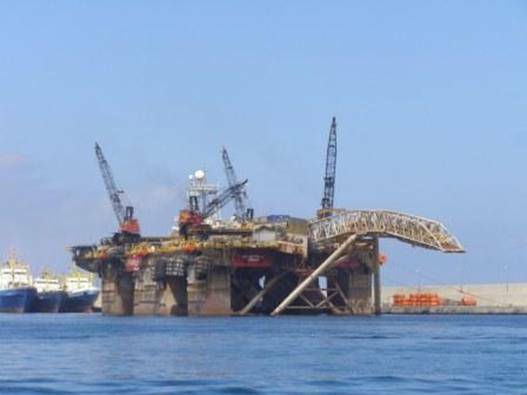 Registered in Panama and it floats! It is also HUGE! Bust my tooth again and had it fixed by a local dentist. I asked if I could have some of his special glue and he said “not really but if it happens again just go to a ferretaria and buy super glue and that will do it”! It lasted until the next meal, bugger! Looks like it is going to be a fun time here prior to the ARC, Storyteller is just down the dock, Blue Anteater (Phil & Robbie from CYCA Sydney) is across the way and L’âme Libre (Jerry & Nancy from Indianapolis) are alongside. The marina officials here say that about 40 of the entries for the ARC are now in the harbour. With 225 entrants to the Rally I have no idea where they will put the rest. You will remember Gunna from earlier in the year. He is the BBQ king of Western Australia and he was determined that we have a new BBQ so he incinerated the one we had, while pretending to roast a leg of lamb, to ensure that we must get a new one. 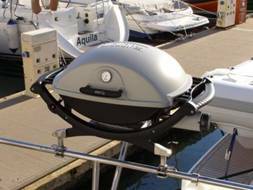 Graham cleverly made the feet for a Weber Q bbq which is in our opinion the best on the market and we now have a sea going Weber Q. Thanks mate it works a treat! Also gathering in Las Palmas are the NARCs (Not the Atlantic Rally for Cruisers) who are those who sail at the same time as the ARC but aren’t prepared to join in or pay the fees but hope to find safety under the umbrella of all those yachts at sea on the one passage. I understand that they can number between 200 and 400 yachts. We are busy getting bits & pieces finalised and in particular I am keen for the Raymarine man to have our system up and running before we traipse off to play tourists. Today, with John & Sue, Irene is off to board the bright yellow double decker bus for a 'hop on hop off tour' of Las Palmas. Should be fun! I am waiting for a courier to pick up some gear that has to go back to mainland Spain for work.